Do Frozen Vegetables Have the Same Nutrition As Fresh? Frozen vegetable nutrition and fresh vegetable nutrition are essentially the same, but the freezing process may cause slight changes in their vitamin content. The way you prepare vegetables at home can also affect the nutrients in these foods. When your favorite vegetables are out of season or you can't find locally grown fresh equivalents, frozen vegetables are a healthy way to meet your requirements for these nutritious foods. Frozen vegetables maintain their mineral, fiber, and carbohydrate content, although they have lost some vitamins. Vegetables are more likely to retain their nutritional value if they're frozen immediately after being harvested. After harvesting, vegetables gradually lose moisture, and their starches and sugars begin to degrade. Vegetables that are intended for freezing are harvested at their peak of ripeness, which allows them to retain their nutrients during the freezing process. Before freezing, vegetables are washed, peeled if necessary and blanched. Blanching removes dirt, destroys enzymes that break down nutrients and preserves freshness by exposing vegetables briefly to scalding water or steam before freezing. Vegetables that are frozen right after harvesting may actually contain more of their original nutritional content than vegetables that endure cross-country transportation and a long period of storage before they reach your table. According to the American Council on Exercise (ACE), the freezing process does not change the mineral, fiber or carbohydrate content of vegetables significantly, but water-soluble vitamins can degrade during blanching. The length of time that you cook frozen vegetables at home may also detract from their vitamin content. Vitamin C, a water-soluble antioxidant that supports your natural immune function and promotes healthy tissue growth, may break down during blanching or boiling. Thiamin and folate — the B-complex vitamins that contribute to healthy heart and nerve function, blood production and metabolism — may also deteriorate when exposed to heat. Phytochemicals, or plant-based compounds in vegetables that offer protective benefits against chronic disease, may deteriorate during freezing. Some vegetables retain more of certain compounds when frozen. 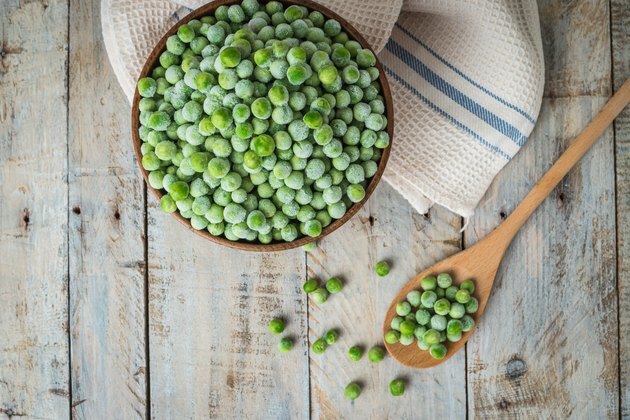 Frozen peas offer more beta-carotene — a pigment that turns into vitamin A during digestion — than fresh peas, according to ACE. When you're buying frozen vegetables, check their nutritional facts labels for added sodium or preservatives. While frozen vegetables generally contain less sodium than their canned counterparts, some brands may include sodium for flavoring or seasoning. Frozen vegetables with added cheese or butter sauces may be high in sodium, fat and calories. To keep your blood pressure within a healthy range and protect your cardiovascular health, eat frozen vegetables without added sodium or sauces. Cooking fresh or frozen vegetables at high heat in a large volume of water may detract from their nutritional content. Heat frozen vegetables in a small amount of water using a steamer or microwave to preserve their water-soluble vitamins. When you're shopping for fresh vegetables, you can find the most nutritious, locally grown produce at a farmer's market or organic grocery store. The less time that passes between harvesting and eating vegetables, the more of their original nutrients you're able to consume. Does Pickling Vegetables Take Away the Nutrition?